5, 6, 7, 8 Imagine, Explore, And Create. Up and away as they leap and turn on their toes, reaching high and low anything goes. Wings to fly aiming so high!! From Fairies to Princesses, counting and singing a happy tune while creating dance and learning to tell stories using the body as an instrument through expression and creativity. 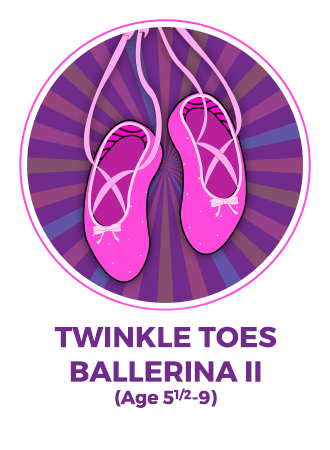 Students will focus on classical ballet and creative dance. ***It is mandatory that all students are properly dressed for class. Students are not allowed to participate in class with tights only and no shoes as it is susceptible to injury. New Student Enrollment fee is $156.00 includes ( $70 monthly program fee, $40 registration fee & $46 dance attire fee (one time fee-leotard/tights/slippers). *Enrollment fee covers class for the 1st month and dance attire. All payments are auto deducted on the 1st of each month. Need to Re-order Dance Attire?